Brighten your home with this wonderful pebble shaped, colour changing mood light. Beautifully designed with a bamboo base, it will enlighten any household with both fragrance and light. The Skye Aroma Diffuser is made with an elegantly carved solid bamboo base covered with frosted glass. The bamboo we use is selected from a sustainable source, which is cut by hand, allowing maturing and flowering strands to remain flourishing and have the least impact on wildlife. 2. Fill the water tank with tap water, up to the indicated fill line. 3. Add 3-5 drops of your favourite fragrance or essential oil into the water. 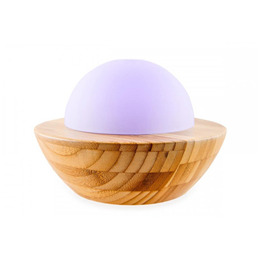 Below are reviews of madebyzen Skye Aroma Diffuser - Mood Lighting by bodykind customers. If you have tried this product we'd love to hear what you think so please leave a review. Love this diffuser. Given to my daughter for Christmas and tried immediately. Gentle mist, soft changing colours. Arrived very promptly. Might have to treat myself!